Preheat the oven to 350F and position a rack in the middle of the oven. Line an 8x8 inch square baking dish with parchment paper and grease lightly with butter. In a small bowl, mix together the graham cracker crumbs and melted butter. Press the mixture into the bottom of the prepared baking pan. In a medium mixing bowl, beat together the cream cheese, sugar, and honey. Add in one egg at time until the eggs are fully incorporated. Add the lemon zest, lemon juice, and vanilla and beat until the mixture is smooth. Divide the batter in half. Stir the blueberry jam into 1 half of the batter. Pour the blueberry batter over the graham cracker layer. Now gently pour the plain batter over the blueberry batter, the batters will mix. Using a knife, gently make swirls throughout. Sprinkle the blueberries over top. Transfer to the oven and bake for 30-35 minutes, until just set, but still a little jiggly in the center. Allow the bars to chill in the pan for about an hour, then transfer to the fridge to chill completely, at least 3 ours. 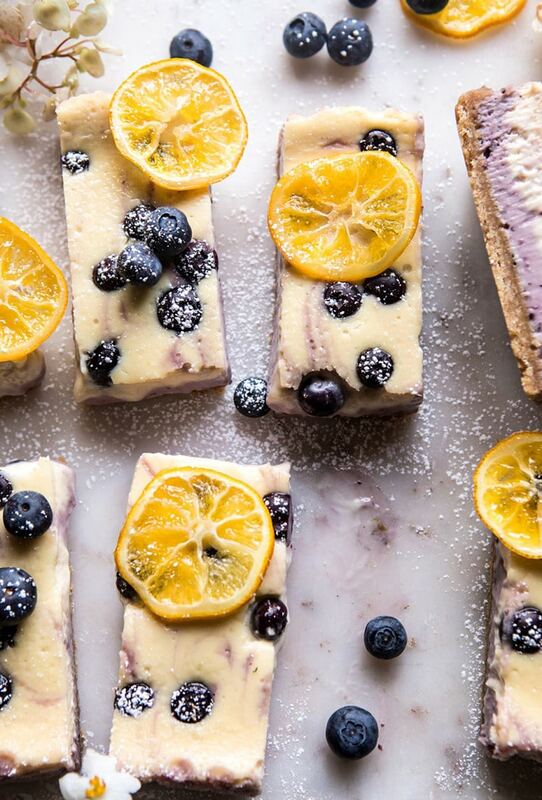 Cut into bars and serve topped with candied lemon slices. DIRECTIONS: Combine the sugar, 3/4 cup water, and the lemon juice in a 10-12 inch skillet. Bring to a boil over medium-high heat, stirring until the sugar dissolves, 3 to 4 minutes. Add the lemon slices and simmer until tender and translucent, about 10 minutes. Remove from the sugar and place on a parchment lined cookie sheet. Allow to dry before adding to the tart, about 2 hours.